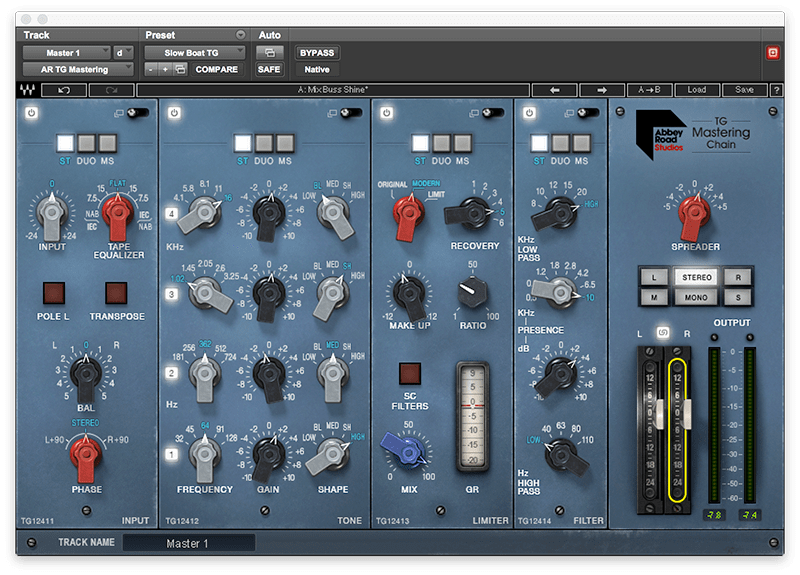 Waves » Learn » Blog » 2019 » Which Compressor Should I Put on my Mix Bus? The Shootout. Mix bus compression is an art, not a science. Each engineer or recording musician has a slightly different approach. There’s no “best” compressor to use for this application, it’s more a matter of finding one that offers the sound and tonal attributes that will give you the results you want for a specific song. Waves makes a range of compressors highly effective for mix bus use, each emulating different vintage hardware units. In this article, we compare five of them to see how their features vary and what their relative strengths are. We’ve included sound examples, so you can hear the compressors in action. Modeled on the EMI TG12410 Transfer Console at Abbey Road Studios, the Waves Abbey Road TG Mastering Chain is a comprehensive, modular plugin that offers a wide range of functions beyond just dynamics processing including EQ, filtering and a stereo spreader. Thus, you can do virtually all your mix bus processing from one integrated plugin. The Abbey Road TG Mastering Chain offers three different compressor/limiter types along with modules for EQ, filtering and more. The input module features input level, balance, phase and a tape EQ. The latter was used at Abbey Road for setting the correct tape type but is cool for creatively applying vintage sounding EQ curves. The tone module offers four bands of EQ with a selection of frequencies and filter shapes. The limiter module offers three different choices. Original mode models the compressor in the actual Abbey Road console, modern mode is a contemporary VCA compressor and limit mode emulates the limiter of the original console. The recovery knob provides six different preset combinations of attack and release times. Other controls include make-up gain, and the ability to switch in internal sidechain filters (particularly useful if you don't want the bass frequencies to overwhelm the compressor), which include high- and low-pass filters and an adjustable midrange bell filter. One of the advantages of this plugin is that each of its modules can be individually set to any one of three operating modes: stereo, dual mono or mid-side, allowing you to apply the compression differently on the sides or center. The spreader knob also lets you widen the stereo image. The Waves API 2500 provides all the distinctive controls of the VCA-based original hardware, which is well-known for creating some serious punch on busses and individual tracks. Its unique tone section offers three settings that let you tailor the response of the compressor. The knee parameter gives you a choice of hard, medium or soft for how fast the compressor will act on a signal. 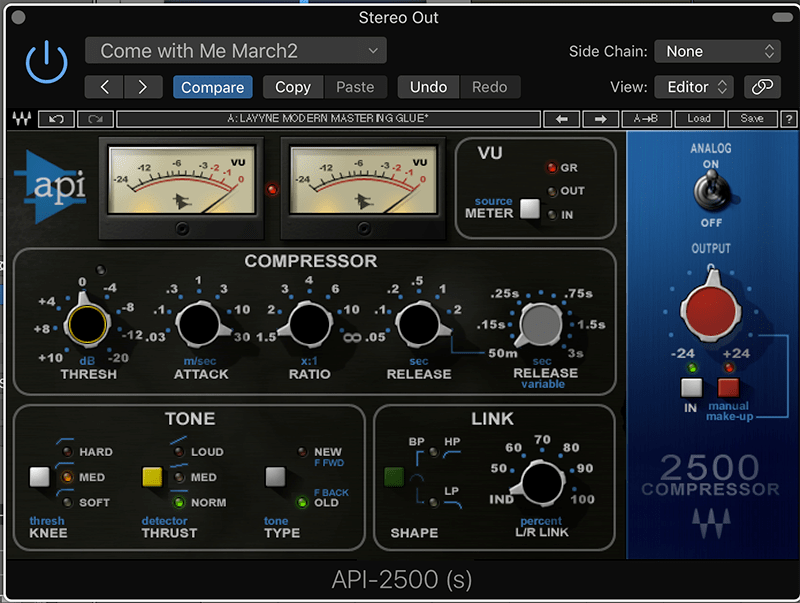 The API 2500 plugin is particularly adept at adding punchiness. The thrust control provides differing amounts of low-end filtering to the signal going into the detector. That gives you the option to process bass-heavy material without the low end triggering the compressor excessively. You can also choose between feed forward (new) and feed back (old) styles of compression. Feed forward sends the signal into the detector from before it hits the VCAs. Feed back sends the signal through the detector after passing through the VCAs. The practical difference is that feed back sounds smoother while feed forward is a little edgier. Like the original hardware, the Waves API 2500 also has a L/R link section, which lets you vary the percentage of linkage between the left and right channels. When both sides are fully linked, a loud event in one side can trigger the compressor to clamp down on both sides, which may not be what you want. 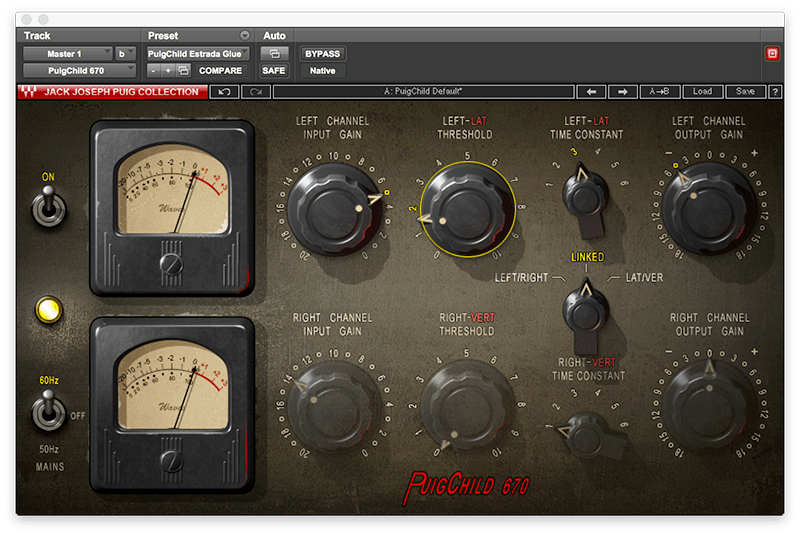 The Waves PuigChild 670, which was developed in collaboration with renowned producer/engineer Jack Joseph Puig, emulates the legendary Fairchild 670 stereo compressor. The original was a variable-mu unit, which meant it raised and lowered levels by adjusting the bias of tubes in its circuitry. The hardware unit had a whopping 20 tubes along with 11 transformers, which all contributed to its revered sonic quality. Although it was primarily known for its use on individual tracks or groups, the 670 could also work its magic on the mix bus. You get plenty of color from this plugin, which adds a subtle high-end sheen to whatever you put through it. The PuigChild 670 plugin is particularly adept at adding punchiness. Unlike some of the other compressors in this roundup, the PuigChild 670 has no ratio setting. Instead, you control the amount of compression by a combination of how hard you hit the input and where you set the threshold. The 670 doesn’t have independent attack and release controls either. Instead, you get six time constant presets which have attacks that are all relatively fast, with the slowest being 0.4ms. Release times have a wide range—from 0.3 seconds to 5 seconds—and there are two auto-release choices. You can set the 670 to one of three operating modes: left/right gives you individual left and right controls and is essentially two independent compressors for which you can use different settings. Linked mode gives you only one set of controls which governs both channels. LAT/VER mode is the original Fairchild term for sum and difference (aka “mid side”), which provides you with separate controls for the mid and side signals. You can use the relative output levels of the mid and side components to vary the stereo image. 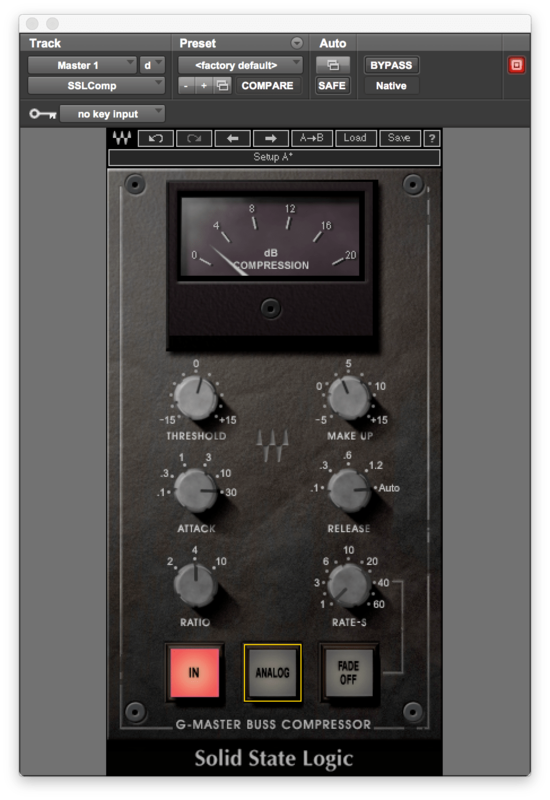 The master section compressor on the SSL 4000-Series consoles is legendary and the Waves SSL G-Master Buss Compressor accurately recreates the controls, sound and behavior of this VCA compressor. Control is simple and straightforward. You get continuously variable threshold and makeup gain knobs. Attack offers six stepped choices ranging from 0.1ms to 30ms. The release provides four preset options ranging from 0.1 seconds to 1.2 seconds, as well as an auto release setting. The SSL G-Master Buss Compressor is easy to set and is adept at all types of mix bus compression. There are three ratio choices; 2:1, 4:1 and 10:1. The analog button turns on and off the analog modeling, giving you some subtle options in how clean and warm the audio sounds. 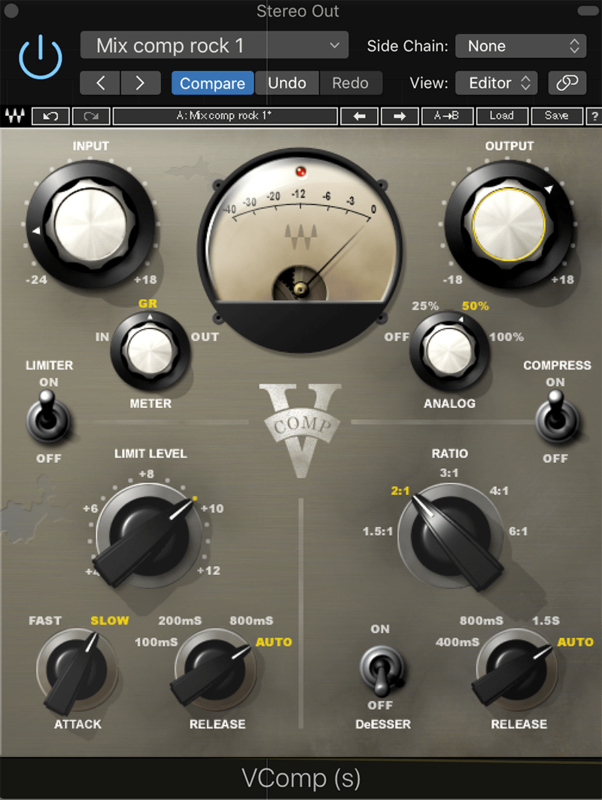 The Waves V-Comp is based on the Neve 2254, another bus compressor from a classic console. The V-Comp plugin gives you analog color as well as the ability to manipulate the dynamic characteristics of a mix. It features independent limiter and compressor sections, and you can vary the amount of analog emulation with the analog knob. V-Comp, which emulates a classic Neve bus compressor delivers instant character to your mix. The compressor section can be switched in and out. Like the original Neve 2254 hardware unit, the plugin has a fixed threshold, so you use the input gain control in combination with the ratio to determine how much gain reduction you get. The ratio control—which has fixed settings of 1.5:1, 2:1, 3:1, 4:1 and 6:1—has automatic makeup gain built into it, which is unusual. When you turn up the ratio, the volume increases. The attack time is fixed at 5ms, but you can choose from several different release times including auto release. The limiter, which precedes the compressor in the signal chain, can be independently turned on and off and has its own settings. One reason you might want to use it is for its faster attack time, which ranges from 1 microsecond to 1ms. Fast attack times can be useful if you’re looking for more transient control than you can get from the compressor with its relatively slow 5ms attack time. The following examples show the five bus compressors in use on two very different songs. The first set of examples features an excerpt from a pop-rock demo of a song called “Come with Me.” The intent for the mix bus compression was to add both “glue”—which is the cohesive sound that applying one dynamics processor across the whole mix can provide—and punchiness. Example 1B: Abbey Road TG Mastering Chain: Chose the modern limiter whose response seemed best suited for this song. Ratio set to 17% and the mix at about 60%. Recovery set to 3, which Waves recommends as a good choice for upbeat songs. Example 1C: API 2500: Used the feed back compression type which sounded smoother. Experimented with the knee setting and liked medium because it kept the sound more open than the fast setting, but had a little more impact than soft for this song. Set the thrust to normal and chose the slowest attack, 30, to preserve transients, and a relatively slow release of 50ms. Example 1D: PuigChild 670: Used the linked mode, set the threshold to get about 2dB of reduction, input halfway up and the time constant set to 5, for a relatively slow attack and even slower release. Example 1E: SSL G-Master Buss Compressor: Really went for punch here. Set the attack to its slowest setting, release to auto, ratio at 4, and turned off the analog modeling to avoid softening the transients. Example 1F: V-Comp: Tried to add punch without sounding obviously compressed. Release set to audio and the ratio to 2:1. Analog set to 50%. Unlike on the SSL, the analog modeling didn’t seem to soften the transients. The second example is an excerpt from "Estrada Bahia," an acoustic instrumental song with a Brazilian flavor by a band called the The TriSonics. Because this features acoustic instruments and is more natural sounding, the strategy here was to set the mix bus compressors to be open and transparent and add glue. Example 2A: No Mix Bus Compression. Example 2B: Abbey Road TG Mastering Chain: Used the modern limiter setting with the recovery at preset 5 which includes auto-release. Added a tiny bit of presence at 6.5kHz with the filter section and boosted a little at 11kHz with the EQ. Also added a very small boost of the stereo width with the spreader. Example 2C: API 2500: Again, used feed back compression type with the knee on soft, thrust at medium. The ratio was set low at 2:1, the attack fast and release slow. Example 2D: PuigChild 670: Really liked how it sounded on this. Used linked mode and got about 2dB of gain reduction. Just let the tone of the plugin do the job. Example 2E: SSL G-Master Buss Compressor: Auto-release, attack at slowest, ratio at 2 and analog in. Was just going for glue here. Example 2F: V-Comp: Auto-release, ratio at 3:1 and analog at 100% for adding vintage tone. 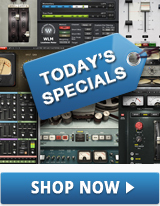 We're not going to declare a winner, because all five of these plugins offer excellent options for mix bus compressing. However, we can offer some observations about each one’s relative strengths. If you’re looking to add punch to your mixes or masters, the API 2500 is a great choice. It consistently added snap to the transients and brought the snare forward in a powerful way. The SSL G-Master Buss Compressor was also very strong in this respect. Although all five compressors added glue to the sound, the SSL was the most adept at this task and the easiest with which to dial it in. Its straightforward controls and auto-release option also made it the most user friendly. For adding color and flavor, the PuigChild 670, V-Comp and Abbey Road TG Mastering Chain were the winners. The PuigChild added a sheen to the top end and a bit of saturation, the V-Comp offered variably saturated fatness and beefiness, and the TG Mastering Chain, with its combination of modeled hardware tone and various EQ and filtering options—especially the unique sounding tape EQ—provided a lot of tonal control without having to open a separate EQ plugin. For controlling different parts of the stereo image, the TG Mastering Chain and the PuigChild 670, with their mid-side processing options were the best choices. Consider the style of song you’re working on and experiment with the responses from each compressor. 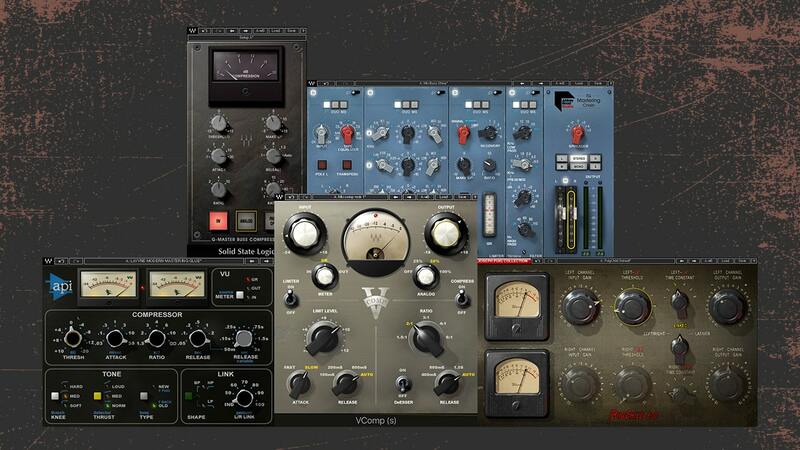 Whichever of these plugins you choose, you’ll get a powerful compression tool that can add cohesion and power to your mix. Keep your gain reduction around 1-2 dB to start with. You’ll discover that the GR amount can be affected not only by the threshold and ratio, but by the attack. The faster the attack, the more compression there is. So, it’s a balancing act between all three controls. It’s useful to spend some time just experimenting with different attack times, release times and gain reduction amounts to get a sense of their impact. Generally, fast attacks will squash transients more, while slower attacks will be more open and transparent sounding. Fast releases can sometimes cause pumping and slow releases can make the whole mix sound less open, because the compressor is staying in its attenuated state too much of the time. Especially when you’re learning the plugin, program-dependent release settings are usually going to work well. In addition to what you’re hearing, the movement of the gain reduction needle can be a good indicator of what’s going on. If every transient is triggering the compressor, it’s an indication you might be overdoing it. Often it can help to get the needle’s movement slowed down by adjusting the compression parameters until it’s moving only on quarter notes. It’s critical to A/B the mix with and without compression regularly as you’re adjusting settings. Make sure that you’re comparing at the same volume because otherwise, the louder one will sound better. Use the compressor’s makeup gain to balance the levels between the two. Many engineers like to put the mix bus compressor on early in the mixing process and “mix into it.” That is, make most mix decisions with the compression already on, so that it’s more organically part of the process, rather than being grafted on at the end. Want more on mix bus compression? Get 8 Tips on Mix Bus Compression, EQ and Saturation here.